I adore Giada De Laurentiis. Giada at Home is one of the few Food Network shows I still watch and I loved Everyday Italian. I couldn’t wait to get my hands on her latest cookbook, Giada’s Feel Good Food: My Healthy Recipes and Secrets . Plus I’m a sucker for any cookbook that lists nutrition information. I was a tad bit disappointed in the cookbook overall because I had to thumb through it several times to find a recipe that I really wanted to make. Out of the entire cookbook, only about five appealed to me. 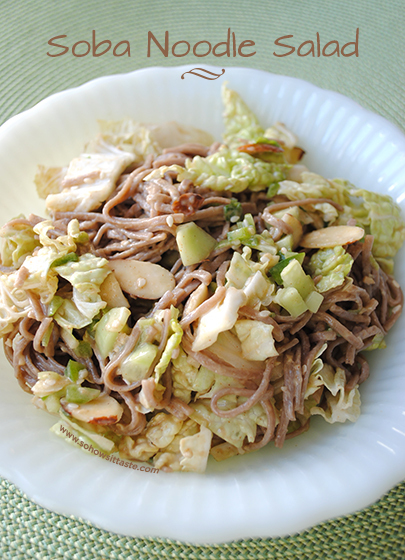 This Soba Noodle Salad stood out because of the dressing ingredients. Almond butter, soy sauce, lime, honey, ginger, wasabi. I had to have it! I really loved this salad. It’s light, refreshing, and packed with flavor. It’s not exactly figure-friendly though. A serving comes in at 562 calories, but the ingredients are good for you, so it’s a trade off. This salad is gluten free, vegetarian, vegan, and dairy free. I don’t seek out those type of recipes, but was really impressed with this salad. The dressing was as amazing as I thought it would be. Nutty, tangy, creamy, sweet, salty, and a kick from the wasabi. This was my first time cooking and tasting soba noodles and I liked them. Mine were darker than the ones pictured in Giada’s book, so they aren’t very pretty, but tasty smothered in the dressing. 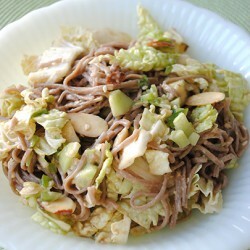 The cabbage and veggies added a really nice contrasting crunch to the soft noodles. My complaint with this salad is that it doesn’t last. The leftovers weren’t appetizing and I ended up throwing half of it out. Great for a crowd, not so great for party of one. The recipe states this is four servings, but there’s no way. A fourth of this salad is HUGE. So on the plus side, it’s less calories since you could easily get six, if not more, servings out of one recipe. I think if you stored the ingredients separately, it would work for leftovers. Only cook the amount of noodles you need for serving. Store the veggies and dressing separately, and just build the salad as you want to eat it. I wish I had thought of that ahead of time before I wasted so much of it. I’ll definitely be making this as the days get warmer and I start to really crave light, delicious salads. 1. Bring a large pot of salted water to a boil over high heat. Add the noodles and cook, stirring occasionally, until tender but still firm to the bite, 4 to 5 minutes. Rinse well in cold water, drain, and put in a serving boil. 2. For the dressing, in a blender or food processor combine all dressing ingredients. Blend until smooth. 3. For the salad, pour the dressing over the pasta. Add all salad ingredients except for sesame seeds. Toss until all ingredients are coated. Garnish with the sesame seeds and serve.